SketchUp (formerly Google SketchUp, now owned by Trimble) has been revamped since I first got it. Now the free basic version is called SketchUp Make (from what I saw in forums a few months ago, I gather that what you download is actually the free trial of SketchUp Pro but if you don’t buy the license when the trial expires, you can keep using the minimal features, i.e., Make. It’s possible this is handled differently now.) 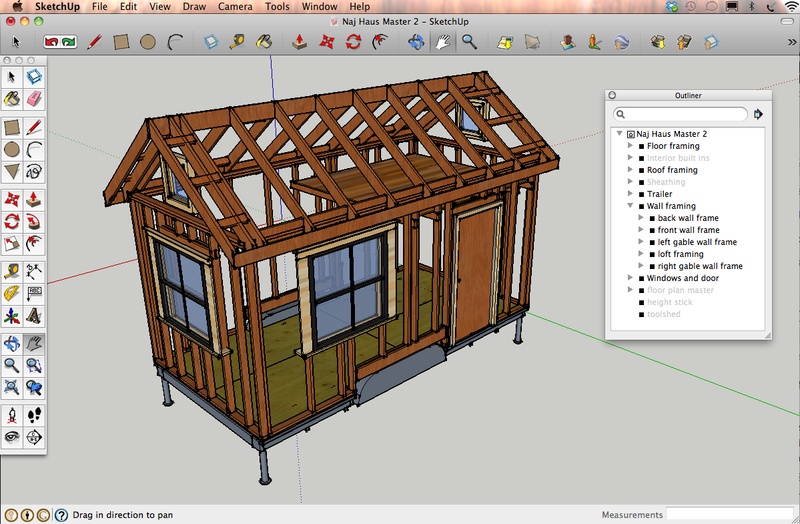 If you are going to be using SketchUp commercially, you should buy SketchUp Pro to be legit. SketchUp also has a Knowledge Center with a user guide. The Learn dropdown menu has various video tutorials and other guidance that is moderately useful. The tutorials I found most helpful were by Matt Donley at MasterSketchup.com. His website has lots of good information and his MasterSketchup.com YouTube Channel has really exceptional tutorial videos. In particular, check out the For Beginners Parts 1 & 2 and the five-part Model a Shed series. This is where I had my “aha!” moment – for the first time I got the concept of groups, components, and how to use a lot of the tools and the Outliner window to stay organized. His videos are perfectly paced and super clear. Another useful site is Matt Jackson’s The Digital Jobsite YouTube Channel. His Carpenter’s Introduction to 3D Modelling Days 1-3 is a good intro tutorial series in which you learn basic SketchUp skills building a sawhorse. The All About Sheds page has numerous videos related to framing a tiny house. And last but not least are Michael Janzen’s (TinyHouseDesign.com) video tutorials – be sure to check them out on his YouTube Channel. 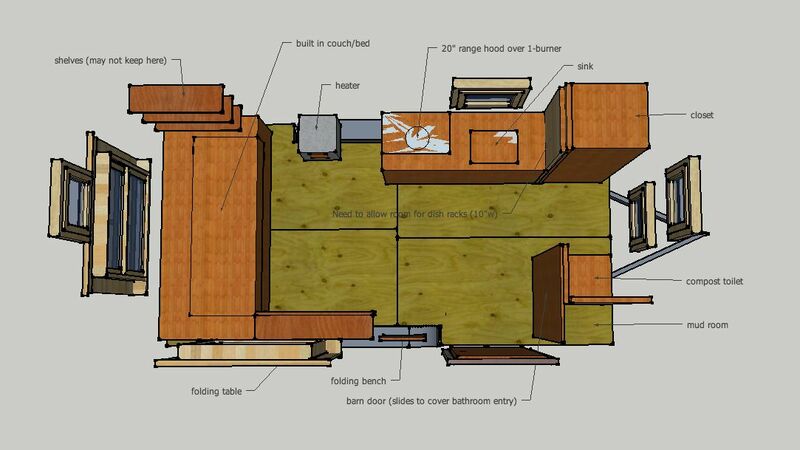 Michael’s also been building a series of SketchUp files for various components useful in designing a tiny house. So far he’s made available ones for windows, a gas fireplace, a woodstove, composting toilet and especially useful, three sizes of trailers (this came out just after I spent seven hours building my own trailer component!). He’s even made available a 20-foot tiny house shell to help you get started with conceptual planning. How to use the SketchUp tools – particularly Select, Orbit, Pan, Look Around, Move, Push/Pull, Rectangle, Rotate, Scale, Ruler, and Dimension. Really understand how to use Groups, how they differ from Components, and when to use each. If you’re using SketchUp to create your actual plans, be sure you are knowledgeable about framing principles. See the Resources page for some of the books I’ve used extensively. Taking tiny house workshops and seeking the advice of professionals is highly recommended if you haven’t framed before. Also, be familiar with standard lumber dimensions and use them to accurately create your studs and sheathing in the model. Explore the component warehouse and how you can download components into your model, and rotate and scale them to fit. If you want, you can upload components you’ve built to share with others. It’s a cool crowd sourcing concept. Aerial view of Naj Haus floor plan. I downloaded the windows and door from the component warehouse and modified them to fit my needs. In earlier designs, I also downloaded furniture and appliance components, but for my purposes here I just used the Rectangle and Push/Pull tools to approximate the various built-ins. You can take the modeling to extremes, adding textures (the free version has a basic set but is limited), landscaping, and photographic backgrounds to really picture what your house will look like. For me, it was enough to just use it for conceptual planning and to create my framing plans, and the free version works perfectly well for that. I love the Look Around tool – it’s like you are inside your house. This is great for figuring out window placement and size, how interior walls will affect the sense of space, and lots more. Creating my SketchUp model was an awesome exercise to go through because it raised so many issues I would have had to work out on site, saving me lots of grief and wasted wood. By the time you’re done with the model, you pretty much know every inch of your house, how everything fits together, what’s connected to what, etc., which is very helpful in understanding the implications of changing something when you’re actually building. Even if you have purchased ready-made plans, you still might want to build your own model. Some plans come with a SketchUp model, but there’s definitely value in building your own from scratch by following the plans. It’s like a construction dry run and will get you intimately familiar with the plans and how it will all go together. SketchUp is great for quickly trying out lots of ideas and then refining your plans, but remember it’s all somewhat approximate – a guide, not a rigid rule book. Once you get your trailer and start laying out your framing, you’re going to need to make many adjustments based on the actual measurements you have to work with. Be aware of how the parts of your model fit together so that if you make changes, they won’t impact something else on down the line. For instance, know which of your studs need to be placed in specific positions so that the sheathing will line up properly, and which studs can be shifted as needed within the proper on-center spacing. I made a lot of changes on the fly during the framing. After the walls were up, I made notes on my plans of the final as-built measurements. I need to put these changes in my model for future use but I find myself oddly reluctant to go back to the virtual world. Now it seems like such a pale imitation compared to the real thing! Reblogged this on Artbermiss System. Thanks for sharing my site! I’m so glad you found it helpful. For Tiny Houses, I’d have to agree with your recommendation to start with the 2 beginner videos, then jump into the shed series. Thank YOU, Matt, for making such excellent tutorials! It’s a real gift to be able to translate complex, technical information into an easy-to-follow format. So glad to have discovered your site and I hope it will help others as much as it did me. These are great tutorials. Thank you. Thanks, Rex – glad you found them helpful!